Queens Community Board 5 will vote on DOT’s safety plan for the Myrtle-Wyckoff transit hub at its monthly meeting this evening. 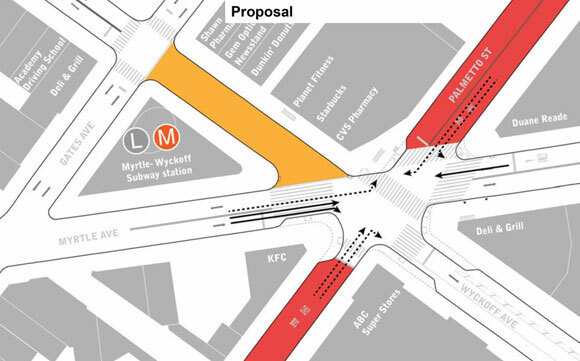 The plan, which creates a one-block public plaza on Wyckoff Avenue between Gates and Myrtle [PDF], won near-unanimous support from the CB 5 transportation committee three weeks ago. Since 2009, three pedestrians have been killed by drivers at the six-legged Myrtle-Wyckoff intersection. Initial changes that simplified turning movements failed to prevent the death of Edgar Torres, who was struck by a turning bus driver while crossing with the right of way in 2014. While CB 5 members have warmed to the proposal, the same cannot be said for Brooklyn CB 4, which represents the southern side of the project area and failed to support the plan last month. Council Member Antonio Reynoso, who represents areas served by both community boards, has said he believes DOT should move forward with the project. You can weigh in on the project at tonight’s meeting, which begins at 7:30 p.m. at Christ the King High School, located at 68-02 Metropolitan Avenue in Middle Village. What a bunch of callous a-holes. I’m so sick of hearing from old people like Arcuri who can’t move beyond the fact that every inch of open space in the city doesn’t automatically belong to cars. The word MTA appears only once in the entire document. If anything, the DOT should come in behind the MTA and let them do their things first. Double-parking and similar problems will shift to other streets. Instead of studying vehicular traffic, the DOT should have focused on pedestrian traffic and accounted for most pedestrian’s actions. Did someone use the Brooklyn Bus Map to find the B52 bus stop, etc? Did someone use the Queens Bus Map to find the B54 bus stop, etc? That person would also be crossing Wyckoff Avenue unnecessarily. Pedestrian traffic is a major research field now with the coming of autonomous vehicles. The DOT should be looking at this research now. Some of it applies to Wyckoff Avenue now. Soon, all of it will. Ironically, the Ridgewood Property Owners and Civic Association: RPOCA, which was so vehemently and in hindsight, perhaps wrongly, against the Fresh Pond Road Street Fair did not take a stand on this issue even though it was fully aware of concerns of at least several of its members. Wyckoff Avenue is an important road for drivers going east to the Jackie Robinson Parkway, the Belt Parkway and Nassau Expressway, Rt. 27 and Sunrise Highway. Drivers going west are headed to the BQE and bridges and tunnels. Its not only Cooper Avenue and Flushing Avenue. To reroute this traffic goes against common sense. I no longer support any one-way options. Greater compliance from motorists could be achieved with a greater presence of the NYPD like on 2nd Avenue and 60th Street in New York. Those officers are amazing and Wyckoff Avenue could use some like them. Cypress Avenue has enough traffic going east and west already. I once notified the DOT of concerns at another dangerous location: Rentar Plaza in Middle Village. Nothing became of it. A poll of 130 people needs to be taken there too. Nothing new in MoveNY that wasn’t discussed in the media, and on peoples’ minds forty years ago. Tolls on the bridges should have been enacted in 1976. It would have been foolhardy for any politician seeking reelection to take this stand at that point in time. Since the average man or woman on the street, AKA the taxpayers, don’t know what is going on behind their backs, the DOT could get out their colored pencils and design a nice big super-sized plaza for the Boulevard of Death. How about in front of the Queens Center?